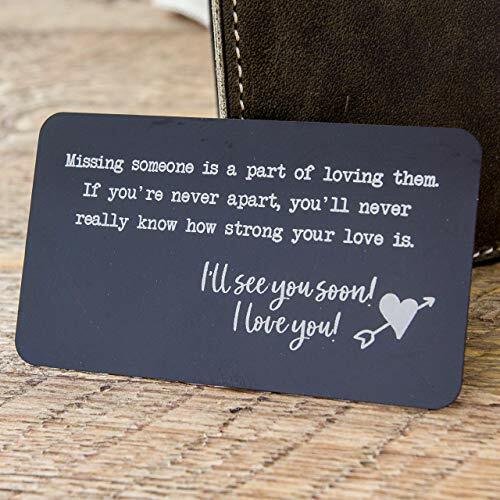 Metal Wallet Card Insert with engraved quote for missing someone - long distance relationship gift - deployment gift - missing friend gift) by Muujee at Nicky's Blog. Hurry! Limited time offer. Offer valid only while supplies last. Perfect gift for anniversary, deployment, or just a reminder for your loved ones. Listing is for 1 black wallet card with the quote shown in images. Perfect gift for anniversary, deployment, or just a reminder for your loved ones. Listing is for 1 black wallet card with the quote shown in images. - Each card comes with a brown burlap drawstring pouch, ready for gifting! - Prime Shipping Available - item ships quick! Text on card: "Missing someone is a part of loving them. If you're never apart, you'll never really know how strong your love is. I'll see you soon! I love you!" If you have any questions about this product by Muujee, contact us by completing and submitting the form below. If you are looking for a specif part number, please include it with your message.